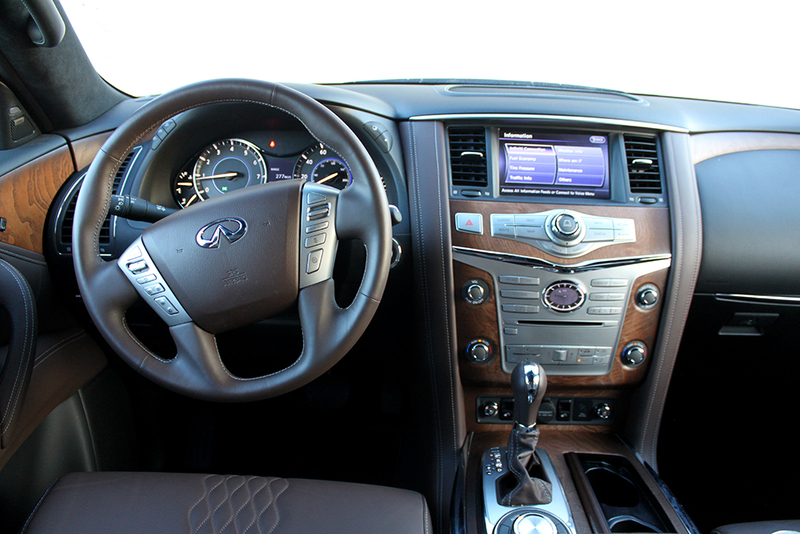 With lots of interior space, luxury materials throughout and a well-balanced powertrain, the 2015 Infiniti QX80 seems like a hit. Yet, it is just so odd. Before I get to why it is odd, let’s review what it is. 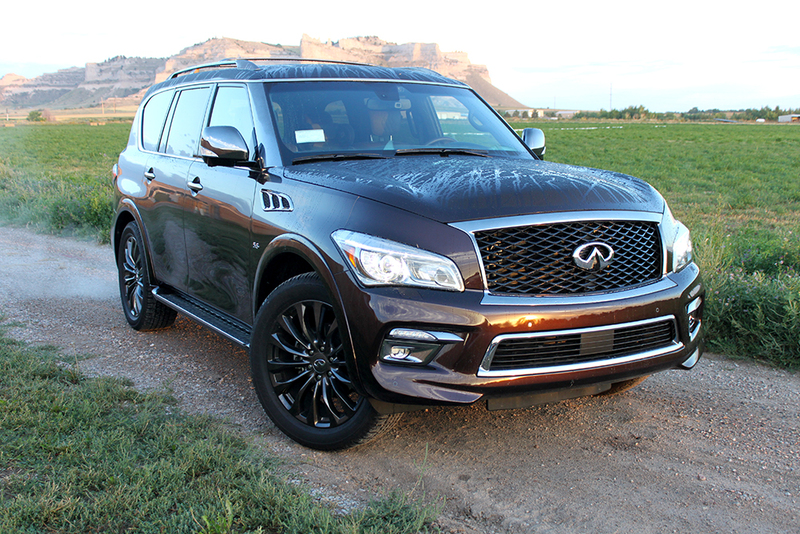 The 2015 Infiniti QX80 is a full-size, luxury SUV. It plays in a segment with such competitors like the Range Rover, Lexus LX 570, Cadillac Escalade and Lincoln Navigator. These vehicles all features powerful engines, luxurious and spacious interiors. 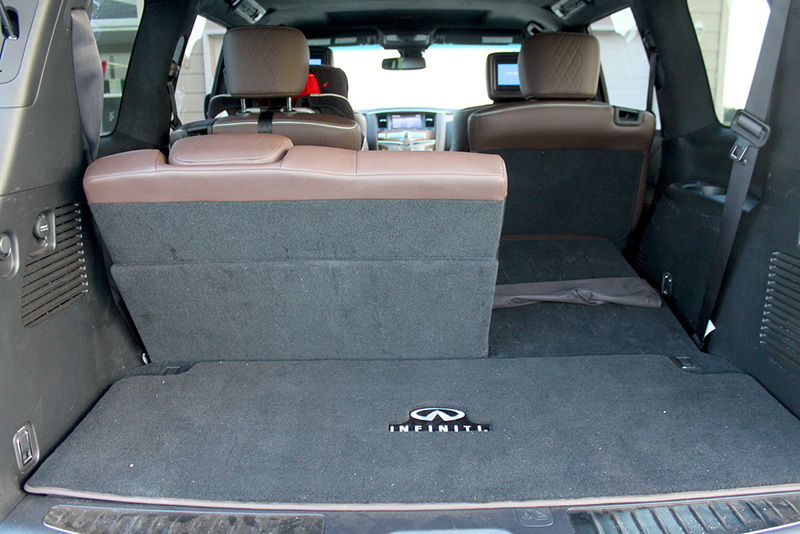 The QX80 hits all of those marks. 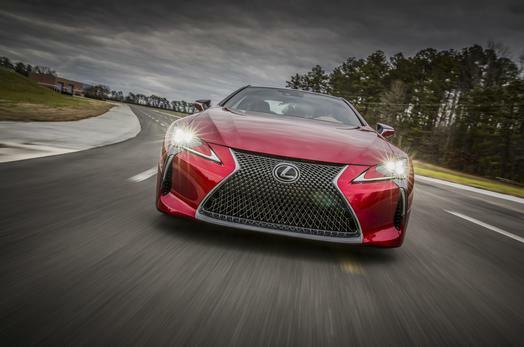 It features their largest V8, a 5.6L which produces 400 HP and 413 lb-ft of torque mated to a 7-speed automatic. This powertrain propels the 5,644 lb, 208.9” long SUV confidently and smoothly unlike some of its competitors which suffer from being too front-end heavy causing the vehicle to rock uncomfortably forward to back off the line. Also, the QX80 tows up to 8,500 lbs. when properly equipped making it an ideal option for towing a boat or a camper. All of this power does come with a compromise – fuel economy. The large SUV guzzles gas with an EPA-estimated 14/20 city/highway for the non-all wheel drive and 13/19 for the AWD version. In comparison many half-ton full-size trucks get better highway and city fuel economy numbers these days. Next, there is no mistaking this is a luxury SUV. 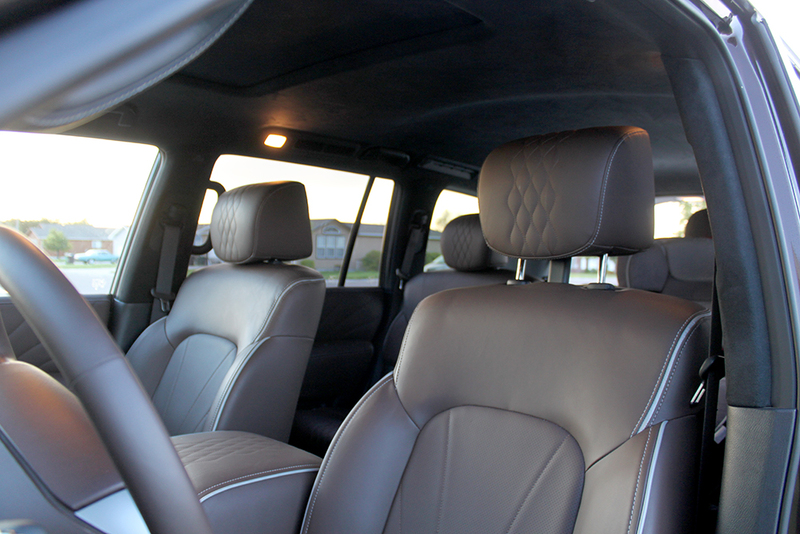 From the exterior styling accents and the roomy (and I mean roomy) interior filled with luxury finishes, it is clear this vehicle is meant for an affluent buyer. The interior room is actually so large it is quite surprising and it takes a while to get accustomed to it. It almost feels like the passenger seat is in another vehicle. The downside of this extra room is the placement of the buttons and knobs could be hard to reach for some individuals. Also, the flat center stack of buttons takes a while to get accustomed to and isn’t immediately intuitive. 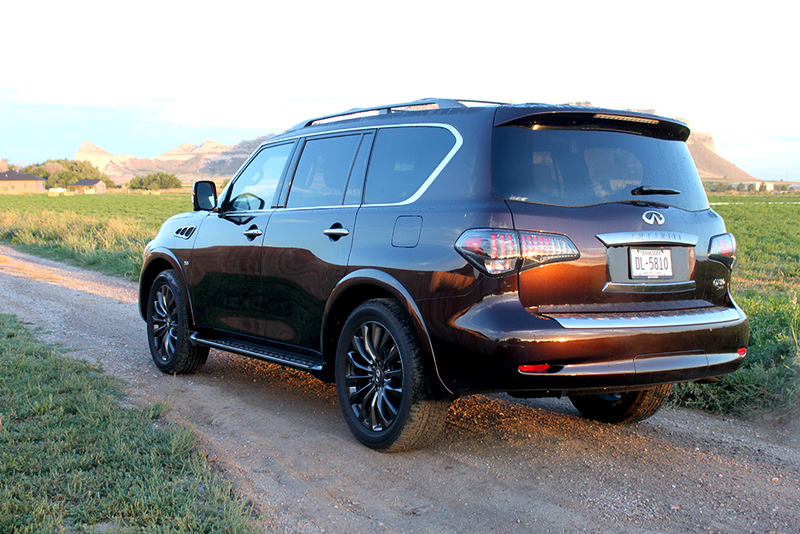 On the outside, the QX80 feels like a mashup of different styling ideas. 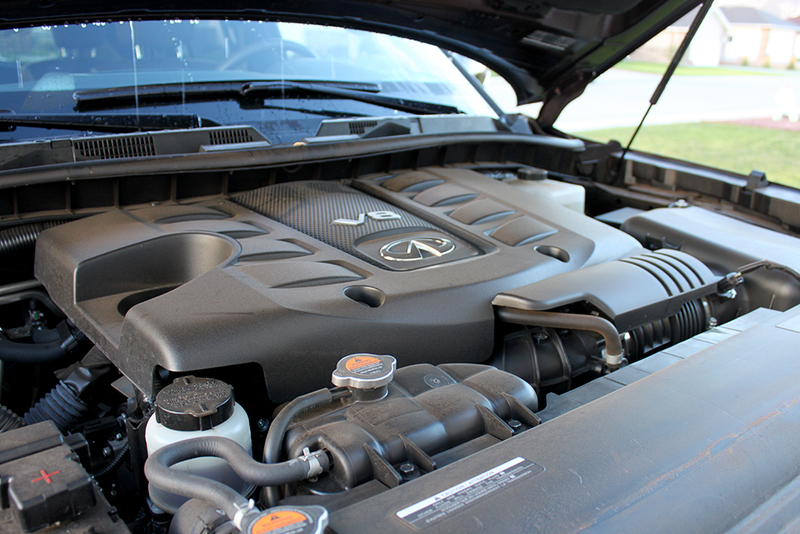 The front design is a carryover of their current design language used throughout Infiniti’s lineup. And while it looks sharp on vehicles like the q50 sedan, yet when you expand it out into the full-size SUV it doesn’t quite work. Moving to the sides, there is a lot of steel here that designers seem to have decided not to do much with. With no character lines and only chrome trim around the windows, it feels like there was an opportunity lost. Rounding off the back, the squarish QX80 leaves a lot to be desired. With that said, why is it “odd?” It simply gives a confusing impression to this reviewer. The styling feels like a mix of styling ideas with not one unified vision coming out strongly. On the inside, the amazing amount of room is offset by the odd-looking center console. And the powertrain feels ready to tow and haul a large amount of payload, yet I don’t see this being a big selling need for consumers in this segment. Rather, I think fuel economy would be more of a priority. 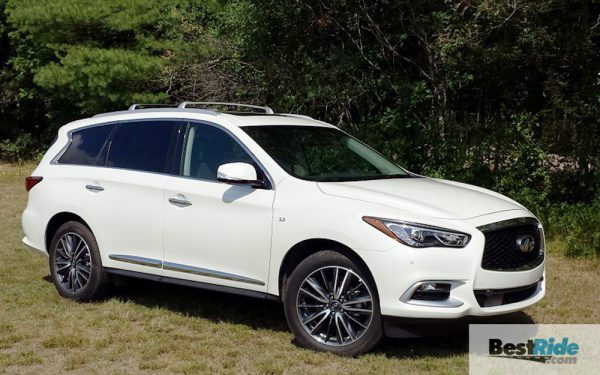 In the end, there is nothing wrong with the QX80 and there is a lot to like – roomy interior, luxurious materials, and a well-balanced powertrain among others. Yet, if looks and fuel economy are big factors, there are better options on the market.